Longtime readers know I love Shakespeare, the Citizen Kane of writers. I don't understand why people insist Shakespeare is difficult to understand. I'll grant that the language is a little arcane to our ears, but I've never had difficulties following the plots or words spoken from a Shakespeare play or adaption. I am a man of average intelligence, and I consider the language on the whole pretty straightforward. What is difficult is seeing people perform Shakespeare because there is this dreadful tendency to treat it all as something quasi-divine. Shakespeare is the Secular Holy Writ, held in such lofty regard as something so above us rather than the tender, tense, or even raunchy entertainment for the masses it started out as. Due to this, Shakespearean performances today tend to make things so grand, to be taken so seriously. It's a great disservice to audiences because Shakespeare is a lot of fun, but one wouldn't know it given how stern everyone is with it (sometimes even with the comedies). The biggest flaw is that many actors (and those who laughingly use the term) are more obsessed with reciting Shakespeare's iambic pentameter than in giving life to the words within said rhyme scheme. There are two ways to go about tackling a film version of Shakespeare: you can go for a straight adaptation and keep the setting, or you can contemporize it in some way (such as West Side Story). This has both good and bad results. In regards to Romeo & Juliet, I've seen only two of the three versions made prior to the 2013 version; the 1968 Franco Zeffirelli is the pinnacle of the former, while Baz Luhrmann's Romeo + Juliet went all-in in the latter*. I didn't like the 1996 version (too frenetic for the material), but at least it kept the language and attempted to make it more accessible to its target audience. The 2013 version tries to straddle the fence: keeping the setting but altering the language somewhat. Romeo & Juliet is by no means dreadful. It has very pretty people in pretty costumes, walking in pretty sets. It tries to stand on its own, but it stumbles along the way. In fair Verona, the Capulets and Montagues are in bitter rivalry. 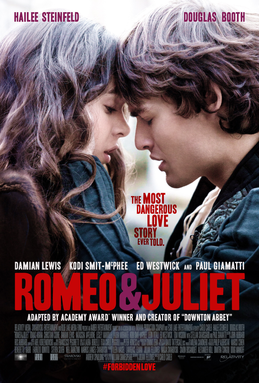 Lord Capulet (Damien Lewis) wants his daughter to marry Count Paris (Tom Wisdom). However, after a tournament that the Prince of Verona (Stellan Skarsgard) organized to settle matters which didn't, hotheaded Capulet nephew Tybalt (Ed Westwick) begins a fight with Romeo's friend Mercutio (Christian Cooke) and Montague Benvolio (Kodi Smit-McPhee). Benvolio reports all this to Romeo (Douglas Booth), who is too involved in his passion for Capulet relation Rosaline to care of feuds. Benvolio, Mercutio, and Romeo sneak into a Capulet ball, where our fickle Montague abandons Rosaline and falls madly in love with Juliet (Hailee Steinfeld). She too falls in love with Romeo and in their passion wish to marry despite their family's bitter feud. In all this, Friar Laurence (Paul Giamatti) sees a way to bring the warring families together, and agrees to marry them. With the help of Juliet's Nurse (Leslie Manville) Romeo & Juliet are secretly united in holy matrimony. Unknown to all, the war between Montague and Capulet continues. Tybalt, still in a rage at the sight of Montagues within his presence, challenges Romeo to fight. While Romeo will not fight, Mercutio is more than willing. In the ensuing fight Tybalt kills Mercutio, and in his 'rage' Romeo kills Tybalt. This causes Romeo to be banished from Verona, but with Laurence and the Nurse's help he goes to a grief-struck Juliet and they spend the night together. Capulet informs Juliet she is to marry Paris, horrifying the already married teen. She will not marry and her father rages. Laurence concocts a plan to save all: he will give Juliet a potion that will cause her to appear dead but only be sleeping. Once she awakes, she and Romeo (who will be informed of all this) will run off together and live out their lives in peace. The plan starts going well, but alas two things go wrong: Benvolio, witnessing Juliet's funeral, beats Laurence's messenger to Romeo to tell his cousin of his wife's death, and thus, Romeo procures poison, goes to her tomb, kills Paris (still mourning the death of his intended), and swallows it before she awakens. Laurence, seeing the lover's reunited too late, can only mourn as Juliet takes Romeo's dagger to join her beloved. Romeo & Juliet is the type of film that people will say, 'well, the costumes were pretty'. Actually, they may say 'the cast is pretty' too, since both leads are extremely attractive physically. We get this immediately, when we first see Booth's Romeo, all heaving chest and pursed lips, bringing to mind Verona's version of EDWARD CULLEN. I can't blame Booth for being so unbearably beautiful, given the former model is barely starting out his career (and I understand his Pip in the television adaption of Great Expectations is pretty good). At one point, even the Nurse waxes rhapsodic on his body. However, in terms of performance I can't say that Booth is particularly good, all soft and whimpering. When he begins with, "I dreamed a dream last night," for a moment I though Booth was going to break out in song. However, whatever rage burned within Romeo at Mercutio's death, whatever passion he had for Juliet, is not communicated via Booth. He isn't all at fault (more on that later). Booth's Romeo, however, is above Steinfeld's Juliet, who is shocking in her weakness. The girl who astounded all in True Grit makes Juliet a non-entity. Steinfeld is blank, boring, and at times almost amateurish. It's like watching high school students try so hard to get a passing grade in their assigned production. The balcony scene is shocking but in the wrong way. Juliet's soliloquy (Romeo, Romeo, wherefore art thou Romeo?) is delivered in a rushed manner, as if Steinfeld wanted to get through it all as fast as possible. Both Booth and Steinfeld never communicated the passion that these two felt. In terms of others, Ed Westwick came off the worst. His Tybalt was hilarious in his one-note sneering and fuming, with the same expression throughout (his long hair/wig did not help matters). I have never been convinced that Westwick is an actual actor based on his work on Gossip Girl (he too has a stiff manner and one facial expression there). Romeo & Juliet may earn him a Worst Supporting Actor Razzie: it's that inadvertently comic performance. Oddly, the more comic Mercutio came off a bit stiff (pun intended) but I put this on the direction than on Cooke, who could have made his final scene more moving if it had been treated with some sense of pathos rather than just recitation. Smit-McPhee had little to do as Benvolio, but he acquitted himself well. It was the adults that showed up the children. Paul Giamatti's Friar Laurence at least seemed to understand what Romeo & Juliet was about (even if the spectacles he wears in the opening did make him a bit more comic). His performance in a better version of Romeo & Juliet is a highlight of the film, as is Manville's Nurse, who was less comic than previous incarnations but had a warmth within it. Same goes for Lewis' Lord Capulet: he is a strong actor and it is nice to hear him in his native accent, and from this we can see that Lewis can lift a poor screenplay. That all the world will be in love with night And pay no worship to the garish sun) is reduced to a voice-over. Fellowes either does not trust the text or trust his audience to follow, which is a poor choice either way. Even worse, he has Romeo and Juliet briefly reunite in the end rather than have Juliet come upon Romeo's corpse as she awakens. Given she's seen him alive (albeit for a minute or two), why then does she wonder why his lips are still warm when she kisses him before she stabs herself? Director Carlo Carlei didn't give his actors much to work with. It seems his main task was to tell them to look pretty (which they did) and to show off the beauty of the Italian countryside. The rushed delivery of the dialogue (in particular for Steinfeld) and the dreamy, soft delivery of the dialogue (in particular for Booth) were I imagine Carlei's handiwork, so it seems a terrible waste. Even in something as rushed as Romeo & Juliet (they fall in love and marry the next day, remember), this version speeds along so quickly one never fully appreciates how dangerous this was to everyone. It is all really pretty, and there are a couple of good performances in it (though not the shockingly bad Steinfeld and the gorgeous but blank Booth). I think everyone gave it a good go, and I can't blame them for trying, but somehow the magic, the power of Romeo & Juliet escaped us. Again, I didn't hate this version, but given that A.) I've seen better on stage and screen, and B.) it had one too many alterations for anyone to appreciate, it is undone by its own ambitions. It is too easy to say that never was a tale of more woe than this adaption of Juliet and her Romeo. Let us just say it was a good try, but like Juliet, it came all a bit too late to revive. * I have not been able to bring myself to watch the 1936 version. 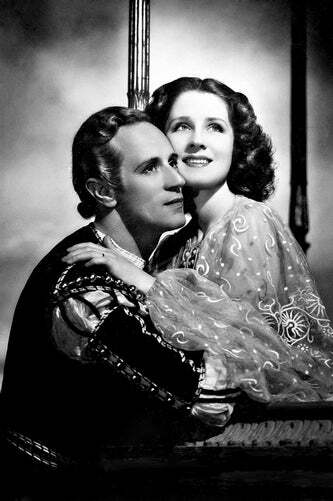 The idea of watching 34-year-old Norma Shearer and 43-year-old Leslie Howard as the doomed teenage lovers, despite their genuine acting talent, is still too much for me take seriously. It's hard enough imagining 36-year-old Orlando Bloom as Romeo in the Broadway production (and that's considering that A.) he is not a particularly good actor in general, B.) he's good only in period pieces, and C.) he's in a theatrical production where such things as age can be forgiven). People old enough to be my parents should not play people old enough to be my children.